Complex, but interesting, this movie definitely has it’s dull moments, but overall it’s pretty entertaining. A fairly worthwhile film, this movie might be all dialogue, but it finds ways to keep you compelled while telling the story of the 2008 financial crisis and stock market crash. Part of the appeal is the way that it focuses nearly its entire first half on just a single company, Lehman brothers, the ones who got it the worst, filed for bankruptcy, and went under. James Woods plays the character running the show for Lehman, but really he ends up letting the show run right over him. once the Lehman story is done, the movie loses some momentum, and gets a little dull. Luckily that doesn’t last long, and when solutions start getting proposed in the later Portions of the film, things start looking up again for the movie. There have been two different movies made about the stock market crash and housing bubble of 2008 that caused all kinds of financial problems for the world. it was the biggest stock market crisis since the great depression, and led to all kinds of hell on wall street (the occupy wall street movement for one). The movies were Margin Call, a sort of low budget, indie film, and this HBO movie, Too Big To Fail. both featured giant star-studded casts. both were also about equally as good as each other. neither movie was great, and both hit some pretty dull moments at times, but still both were generally pretty interesting. the main difference between the films is that margin call is about one single company that discovers the problem and too big to fail is more about the bigger picture. It’s about all of the companies and the government’s response. this is the movie that tells the whole story whereas margin call got a closer look at just a part of it. But too big to fail also goes into margin call territory too, by spending nearly all of the first half dealing with the circumstances that surrounded a single one of these companies, Lehman Brothers. Lehman Brothers are the company that did not get saved by the government. After bare Stearns merged with another company in order to avoid going under, it looked like every company would be able to find a way out. most of these came at the expense of the government. Lehman Brothers were another company in hot water. they stayed naive the whole time, never willing to believe the circumstances that were happening all around them, and this led to their demise. James woods plays the CEO of Lehman brothers here, and it is perfect casting for the role. woods is the kind actor that you love to hate. His most memorable roles are in movies like casino, where he is just one of many working components, coming in, doing what he does best, and then getting out of there. his role in too big to fail is similar. His character, Richard Fuld, is the guy who makes all the wrong decisions, and unintentionally leads his company straight into bankruptcy. watching woods go to work in this first half is a thing of beauty. Every time there is a Potential way out, such as when warren buffet offers to buy their stock for a lower price than they wanted, Fuld screws it up. all he can think about is what the company was trading at yesterday, and he can’t get over the way things have changed so quickly and so drastically since then. When a guy under him that he should not show up to a meeting tells fold, Fuld can’t help himself. He not only shows up to the meeting with some Potential Korean buyers, but also acts disrespectfully and brash, causing the whole deal to implode. At about the halfway Point of the film, Lehman does go under and the Fuld character stops appearing in the movie. at this Point, the movie takes a turn for the worse. 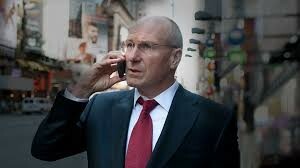 Aside from Fuld, we’ve been seeing lots of exchanges that involved Henry Paulson (William Hurt), who is pretty much the star of the film. Paulson is the US secretary of treasury, and he’s the guy in charge of what the government is and is not willing to do for these companies. After Fuld leaves the movie, Paulson becomes the character that we follow most. While William Hurt is a tremendous actor, he doesn’t have the kind of appeal that wood did, and his character here is more dull than fascinating. so are the characters he spends his time with. 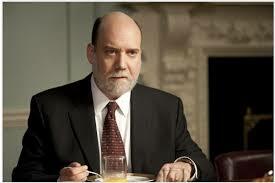 Paul Giamatti, for example, another fantastic actor, can do nothing for his role here. maybe that’s because the entire movie is dialogue and there’s only so much you can do with that. in the first half we were loving it, totally on board, but after a while, it just runs out of steam. But then after that middle bump of not knowing what to do, and things looking gloomier than ever, solutions start being proposed. one is the idea of merging big companies together. Bear Stearns did it, and now the government is suggesting that other companies do it as well. There’s a cool scene where Billy Crudup’s character stands over a desk looking down at the index cards on it, which say different company names, such as bank of America, Merrill Lynch, Morgan Stanley, and CitiGroup. he tries to move the cards around and put them together in pairs that will make sense. This plan of merging companies together is met with disagreement from the coos. that’s when the government comes up with another idea. they are going to throw tons of money at everyone, even the companies that don’t need it. this will make it so that the public doesn’t know which companies really needed it and which companies didn’t. all that people will know is that every company is doing okay. it’s like false advertising or playing mind game with the public, so that what they see on the surface is not the real story of what went on behind the scenes. there’s a lot to like about this movie. most of the dialogue keeps you glued to the screen and fascinated about how all this could have really happened. Featuring the James woods – Lehman brothers story for nearly the entire first half of the film is a smart movie. it gets us interested right away. I also like the way at about the halfway Point this movie breaks away from that story to move into the bigger picture. Instead of just focusing on one company, it suddenly starts to focus on everyone. Some of the momentum is definitely dropped here, and that just goes to show how much credit the Lehman brother’s story deserves, for holding our attention so well. but the movie does get back on track for it’s ending and clever ideas. this is a complicated movie to follow, but it’s also very entertaining.